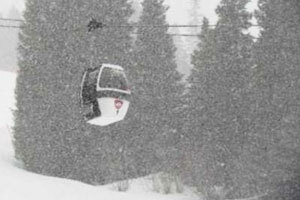 Find your own ski in and out by owner rental in Winter Park-click on this link! 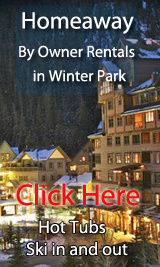 Winter Park By Owner Rentals - Our Blog! Pick your own By Owner Vacation Rentals here for Winter Park from the full list - ski in and out! By Owner Rentals are a wonderful way to head to the slopes! You get a full kitchen, much more space and in all a quality experience. In Winter Park this seems to be a better option than a hotel - the quality is higher. 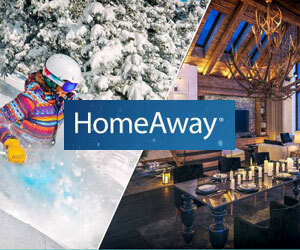 We work with Trip Advisor and Homeaway. True SKI IN/OUT! GREAT VIEWS of slopes , 2 bdrm, 2 bath, slps 6, from $386/nt - Book it! VRBO 321055 -ZEPHYR! PREMIER TRUE SKI-IN SKI-OUT 2BR/2BA CONDO ON A HIGH FLOOR (Slopeside) OVERLOOKING THE SLOPES (Lower Hughes, Brian's Way and Corona Way) WITH GREAT VIEWS. No building is closer to the slopes at Winter Park resort than Slopeside. You feel you can almost touch the riders on the Zephyr Express lift running directly in front of you as look out from the condo! In the morning, while you sip your freshly ground coffee in your king-size bed, you can watch the first riders up the lift, or the first skiers down the slope. Then take a convenient elevator to your personal ski locker (the one closest to the slopes!) and ski down to the Zephyr lift. When you are ready for a break, just ski back down to your door from any of the slopes in the WP resort and fix lunch in your well-equipped kitchen. From any of your windows or your balcony, you can check out the lift lines at four ski lifts near the base, or watch activity on the plaza, or see when hot tubs are occupied. 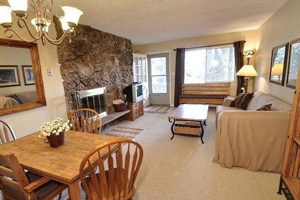 Great Ski Condo Only 50 Ft Walk To The Lifts , 1 bdrm, 1 bath, slps 6, from $209/nt - Book it! VRBO 502513 -Oversized 1 Bedroom with queen bed, bunk bed and aero mattress. Sleeps 6 people. Full kitchen stocked with all the equipment to cook a great dinner. 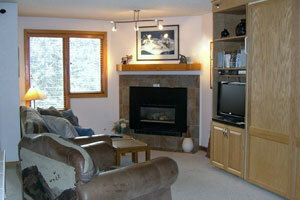 Closest unit to the slopes, ski down to the condo and take a break for lunch then hit the slopes for the afternoon. Hot tubs and fitness room just down the hall. First floor condo so no elevators to deal with. Ski locker to store your skis or snow boards. Starbucks and restaurants right next door. Heated underground parking. Take the free shuttle right from this building to downtown Winter Park for dinner at one of the great restaurants. Cozy and Family Friendly -2 bed, 1 bath, slps 6, from $110/nt - Book it! 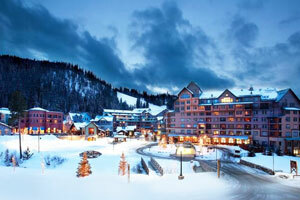 Ski-in/Ski-Out, 2+BR/2B - Iron Horse Resort, Best Location, 5 Star, 2 bdrm, 2 ba, slps 8, from $199/nt - Book it! VRBO 252429 -Your perfect vacation awaits you at the Iron Horse Resort unit 5094. Our 5 star condo has been extensively renovated, providing a relaxing 'home away from home' for you and your family or friends. Please call owner, Barb 303-564-2048 to discuss any details. Just outside our front door is access to the ski bridge and slopes, we are the closest 2 bedroom in Iron Horse to the ski access (see photo); no lugging ski equipment up and down stairs, no elevator waits and hiking from other Iron Horse buildings...you are staying in the best location just 30 steps from the ski slope! So enjoy the ultimate convenience in skiing, the comfort of our home and the numerous amenities of Iron Horse Resort. Digital access code door lock eliminates need for keys. For our spring and summer guests, our convenient location is just a short walk (5 minutes) to the new Winter Park Village where they have an alpine slide, mini golf, restaurants and shopping; plus you have direct access to the mountain bike and hiking trails. We can also arrange to have your groceries in the refrigerator upon your arrival for a nominal fee. If you rent our condo and need ski equipment rentals, please advise and we can get you 25% discount on your ski equipment rentals, plus the ski shop is on the ground floor of our condo complex. Ski in/out, mountain view, fully remodeled studio, 5th floor, 90 steps to ski , studio, slps 4, from $164/nt - Book it!